Okay, apparently it’s spirulina aka or a natural algae powder. I order it because I’m down for anything with funky names and cool sounding flavors. They also told me it will taste like a bowl of fruity pebbles. I’m even more excited now because fruity pebbles were my JAM back in the year of Y2K. Don’t act like you don’t remember that year: it was everyone thought their clocks and computers would stop working forever. Little did we know that years later we’d be drinking blue magik bowls and chugging unicorn drinks. The 2000’s have been fun, no? Anywhoo. Let’s move on to veggie burgers! 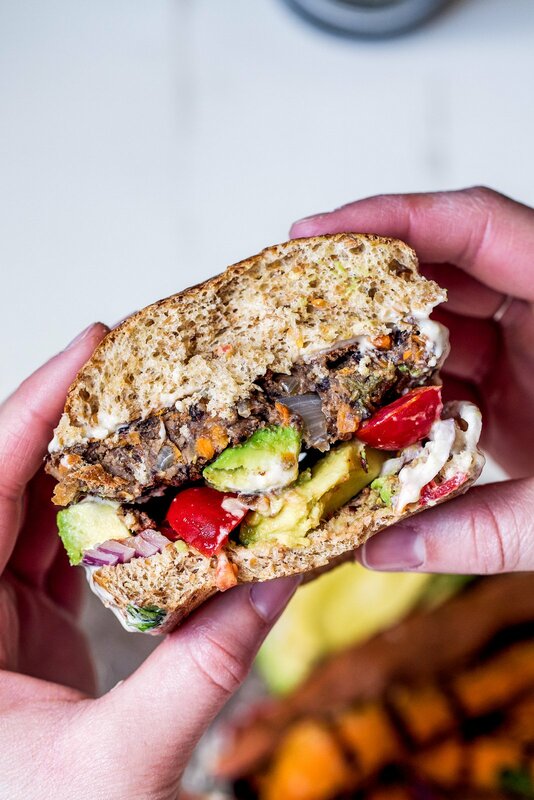 There’s no ‘magik’ in these vegan black bean burgers, but they do taste quite magical with a homemade garlic tahini sauce and creamy avocado on top. Best of all, these freeze extremely well, which makes them excellent for meal prep. Try these grilled sweet potato fries or my thai quinoa salad! I hope you get a chance to make these magiKcal burgers. You can choose to put them on buns or wrap them in lettuce wraps, or simply enjoy as is. NOM NOM NOM. 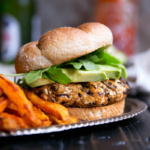 Delicious veggie packed vegan black bean burgers with plenty of delicious spices. I call these the ultimate black bean burger. Top with avocado, onion, tomato and a yummy garlic tahini sauce! 1/4 -1/3 cup oat flour, gluten free if desired. Mix flaxseed meal and water in a small bowl and place in the fridge for 5 minutes. Place a large pan over medium heat and add 1 teaspoon of olive oil. Once oil is hot, add in onion, garlic and carrot; saute for 5 minutes or until onions are translucent and carrots begin to soften a bit. Transfer to a large bowl and stir in the spices: cumin, garlic powder, chili powder, paprika, salt and pepper. Using a food processor or high powered blender, blend black beans until well blended and just a few bean chunks remain. Transfer to the bowl with the veggies and then stir in the flax egg and the oat flour. Taste, adjust seasonings and add additional salt and pepper if necessary. Divide mixture into 4 patties. Put on a plate and cover with plastic wrap, place in the fridge for 10-15 minutes. 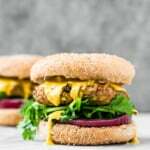 While the burgers are in the fridge firming up, make the garlic tahini sauce by mixing together the following in a small bowl: tahini, garlic, lemon juice, water and salt. After 30 minutes, place a large skillet pan over medium heat and generously spray the pan with nonstick cooking spray. Add the patties and cook 4-5 minutes on each side, or until golden brown and heated through. 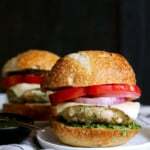 Place on buns with tomato, avocado, red onion and tahini sauce. 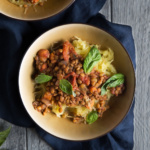 Serve with sweet potato fries or a salad. Makes 4 burgers. If you make these, be sure to tag #ambitiouskitchen on Instagram or leave a comment below letting me know how you liked them! 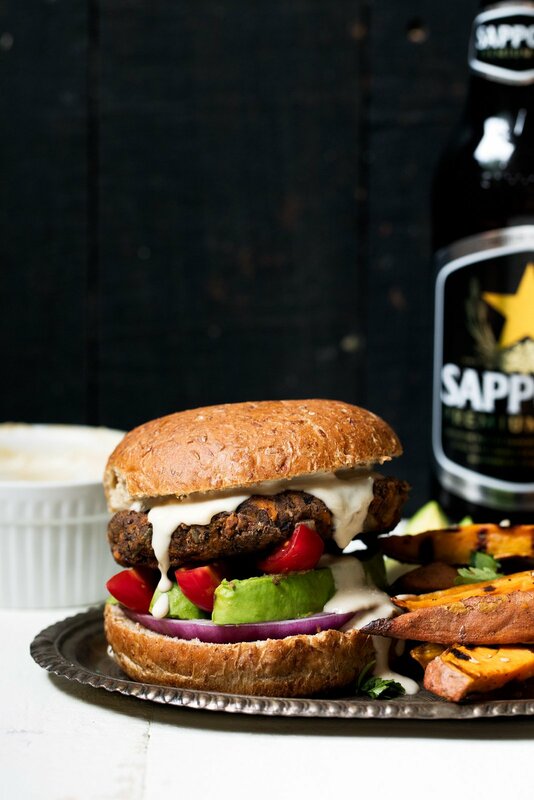 41 Responses to "Ultimate Vegan Black Bean Burgers with Tahini Garlic Sauce"
Quick question, would I freeze potential extras (not that I’m sure there will be any…) before or after cooking them? Thanks! Hi Kirsti! You can freeze the burger “mixture” before cooking them 🙂 Enjoy! These look delish! I’m sure I have some dried black beans in the cupboard, now I know what to use them for. 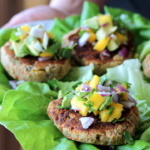 These look so STURDY which is so hard to achieve with bean burgers- I can’t wait to make a big batch and try ’em on the grill! SO true – these hold up well! Enjoy! These look so delicious! I just made the healthy glow go roasted garlic black bean burgers and froze some. I can’t wait to try this sauce also! if you are not vegan could you sub a normal egg and flour? Hi Amanda! I would suggest a normal egg and breadcrumbs (rather than flour). OMG! I want one of these burgers! They looks soo delicious! 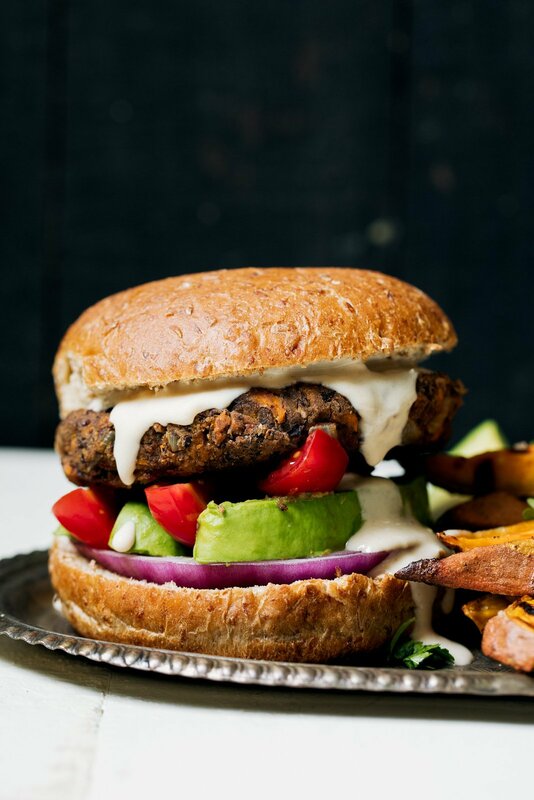 I have never made a black bean burger but I think I need to! ESP….THIS recipe! YUM! Just made these and they were delicious!! As was asked earlier, can they be frozen? I am guessing to freeze them uncooked? I am a beginner cook and have tried some of your other recipes. I can’t get them to look anywhere near as good as you do, but they taste great. 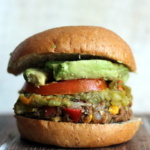 The Ultimate Black Bean burger was awesome and easy to make. Thanks! Loved these and so did my boyfriend! We’ve made them 2x in one week. I only had whole wheat flour and it still worked really well! They are the sturdiest veggie burgers I have ever made (I’ve tried a bunch because my boo is vegetarian). He had them with buns and I had mine over brown rice…we also added a fried egg on top for extra protein and it was amaze! 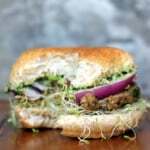 I LOVE veggie burgers that are loaded with goodies such as carrot and onion! Sweet potato and red bell peppers are my favorite too! Do the black beans need to be drained? I would revise the recipe to state this. I didn’t drain and they were a fail, although the taste was good. Will try again with drained beans! Planning to make these! Could I bake the patties instead of cooking them on the stove? Can’t wait to try these! Can I bake the burgers? And if so, for how long and at what temperature? Thanks! You bet! I haven’t tried it, but for these I’d bake them for about 10 mins on each side at 375 degrees Farenheit. I have made these a couple of times. We love them! I froze several uncooked patties and plan on using them for dinner soon. What’s the best option for cooking them frozen? So great to hear! I would thaw them at room-temp before cooking them in a skillet or on the grill. Made these burgers last night and they were perfect! I used almond meal instead of oat flour and it worked out fine. Next time I might try egg instead of the flax egg to see how they hold together differently. Can I sub almond flour for oat flour? I made these tonight. Delicious! However, they were very soft. I followed the recipe to a T. Any suggestions as to how I can firm them up a bit? Hi Pat! Black bean burgers do tend to be softer than regular burgers. You can try adding a tablespoon or two more of the oat flour to firm them up! This was easy and tasted great. I used gobonzo bean flour and it was so good. Can I use almond flour or something else instead of oat flour (can’t do oats yet after six months on a very restrictive diet)? Hello, can you use azuki beans instead of black beans?